Ozone is found in both the upper and lower atmosphere. Ground-level ozone in the Bay Area is primarily caused by motor vehicle exhaust. 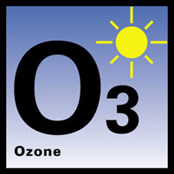 Ozone is a colorless gas formed through a complex series of photochemical reactions involving sunlight and heat. It is not emitted directly into the air in significant quantities, but instead is formed from these directly released "precursor" pollutants: reactive organic compounds and oxides of nitrogen. In the Bay Area, ozone is primarily attributed to exhaust from combustion engines, such as those that power cars, trucks, trains, boats, construction equipment, lawn mowers, and other mobile sources. In the Bay Area, ozone is the main summertime cause of poor air quality. Warmer temperatures and longer hours of sunlight facilitate its formation. Extensive morning and evening commutes, a high-number of single occupancy cars on the road, as well as older higher-polluting cars and trucks all contribute significantly to ozone pollution.